According to Ramez Baassiri Business plans – like all plans – can go awry when events beyond the control of the business owner disrupt the everyday routine. Don’t just adapt to change, embrace it. “Every family business has dealt with and will deal with interruptions, from the expected changes and challenges of growth to the unexpected interruptions resulting from loss and poor decision-making, and everything in between,” Ramez Baassiri says. “You must be ready to accept and even embrace such changes as they come, to get creative with them and use them as a catalyst for improvement. 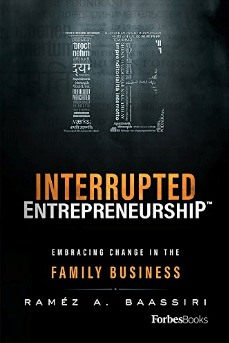 Raméz Baassiri, author of Interrupted Entrepreneurship: Embracing Change in the Family Business (www.ramezbaassiri.com), is a board member of a multinational, multigenerational family business. An author and graduate of a doctoral program, Raméz is a firm believer in education through storytelling—a concept that can, and does, change the world for the better.